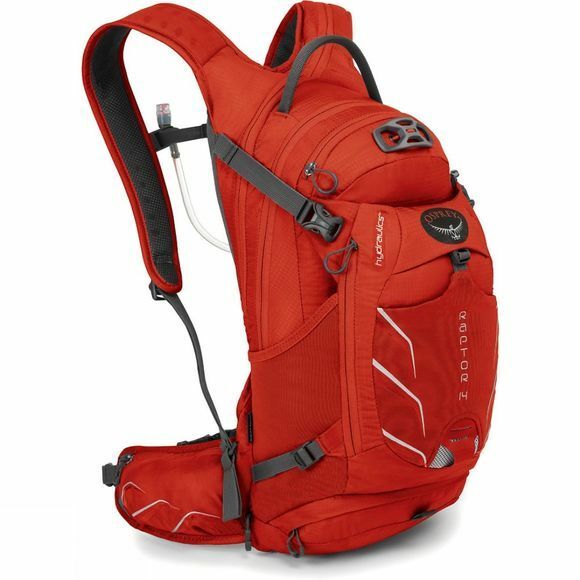 The Raptor 14 Hydration Pack is a great long haul pack for an all day adventure on your favorite single track. As well as the sizeable main compartment, stretch woven side pockets add to the versatile gear carrying options already offered by the large zipped front pocket, internal organiser sleeves, hipbelt pockets and the roll-out tool pouch. Included with the Raptor 14 is an Osprey Hydraulics hydration reservoir complete with drinking hose. This sturdy bladder is shaped and stiffened to provide maximum comfort within your pack, and the hose's bite-valve attaches quickly and easily to the elasticated sternum strap with a magnetic clip.